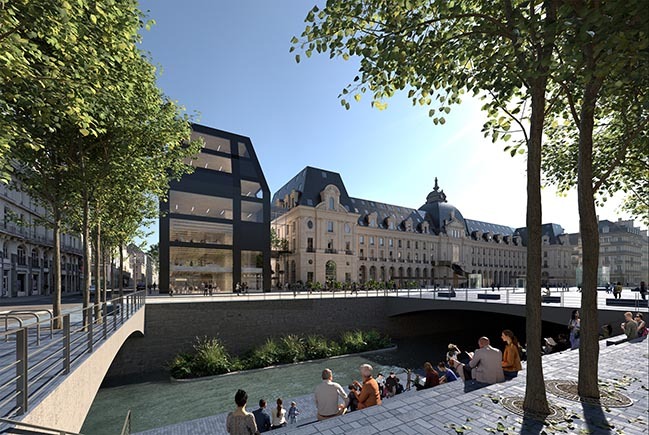 MVRDV has won the competition to renovate and extend the historic Palais du Commerce in Rennes. 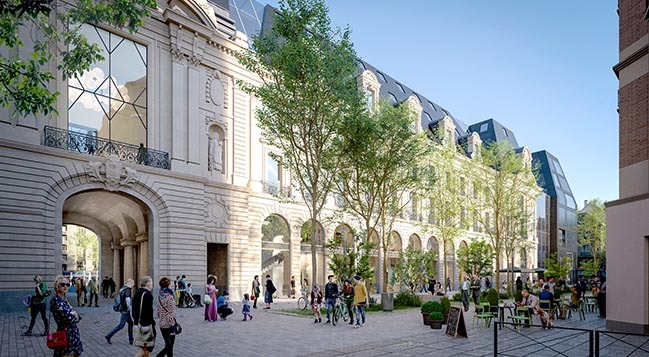 Developed alongside co-architects Bernard Desmoulin for developers Frey and Engie Avenue, the 18,000-square-metre redevelopment of the notable Rennes landmark will signify a renaissance for both the building and its surroundings. From the architect: MVRDV’s proposal will reactivate the Place de la République and turn this former public building into a centrepiece of the city’s main commercial street, raising it to the level of significance that was initially intended. Located in the southern part of Rennes’ city centre, the Palais du Commerce was originally constructed in two stages between 1885 and 1929 as a post office, library and arts school by local architects Jean-Baptiste Martenot and Emmanuel Le Ray. Today, the building is poorly integrated into the life of Rennes, with most residents unaware of most of the activities inside. The renovation and extension designed by MVRDV aims to rectify this, activating the building with new uses and a design that communicates these new functions to passers-by. 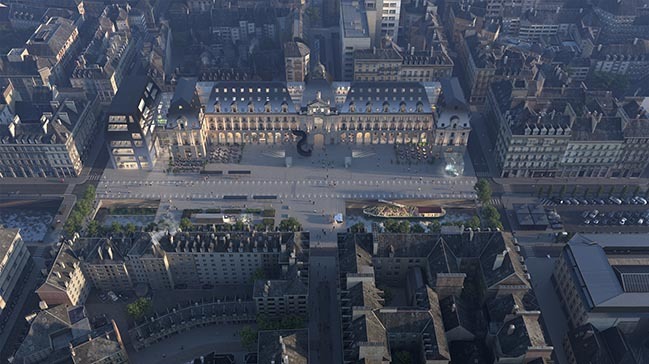 On the urban scale, the scheme will favour pedestrians and transform the Place de la République into an inviting public square in which to spend time. 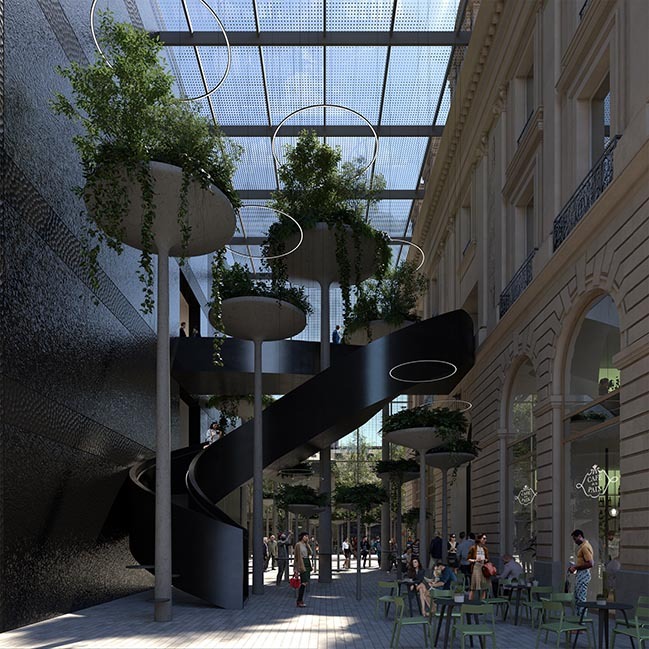 Alongside the efforts of the municipality to reorganize the bus network, the project plans to convert the Rue du Pré Botté, on the Palais du Commerce’s southern side, into a landscaped pedestrian area animated by terraces. The proposal also recommends the partial re-opening of the cover of the river Vilaine. The design is respectful of the existing building while taking a critical approach to its drawbacks. A key approach was to increase the building’s transparency: windows will be replaced, with larger panes of glass giving improved visibility. Meanwhile on the ground floor, glass storefronts will be added in the arches of the arcade in order to provide more space for the commercial units. This alteration is designed in such a way that the visual effect of the arcade is preserved, as the walls introduced into the arcade separating the different shop units will also be glass. The most striking exterior change to the existing building is the addition of a grand, winding staircase at the centre of the façade, a tongue-in-cheek reference to the fact that the original building did not have the elegant foyer space or other spatial centrepiece typically found in such grand buildings. This addition also serves a very functional role in the new layout: on the second floor, a welcoming reception area sets up a path through the building’s upper levels. The 18,000-square-metre project – which includes 12,000 square metres in the existing building and a 6,000-square-metre extension – introduces new shops, a hotel, offices, a coworking space, a variety of leisure spaces (including a LEGO museum and event space and an electronic music bar), and a school for the kitchen and hotel industry led by chef Thierry Marx. The extension, on the eastern end of the building, comprises a wood construction that imitates the forms of the original building while adopting a modern architectural expression, with a façade of black textured ceramic and opaque glass panels which references the black slate roofs of the Palais du Commerce and other buildings in the city centre. 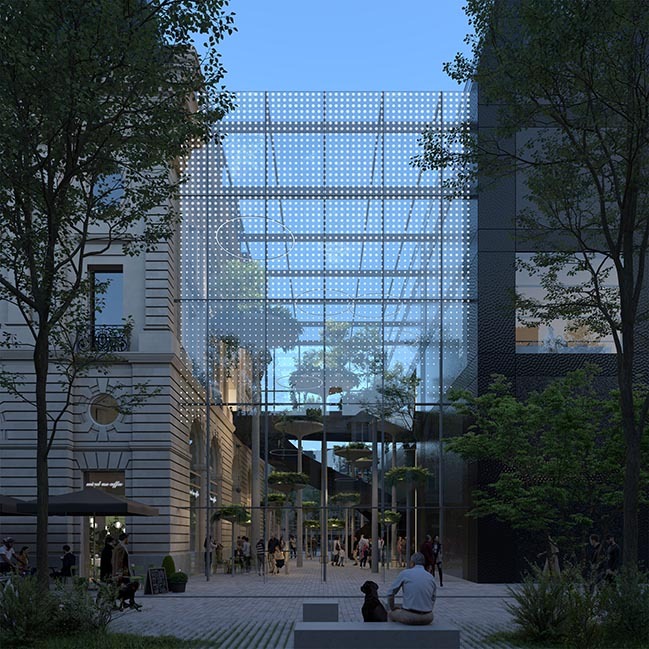 This will be respectfully connected to the existing building by a glass gallery that, like the passage through the Palais, offers permeability at street level. Inside, a second winding staircase connects the route through the building’s second floor level to the new entrance on Place de la République. The new design makes the most of invisible methods to intensify the building’s usage. 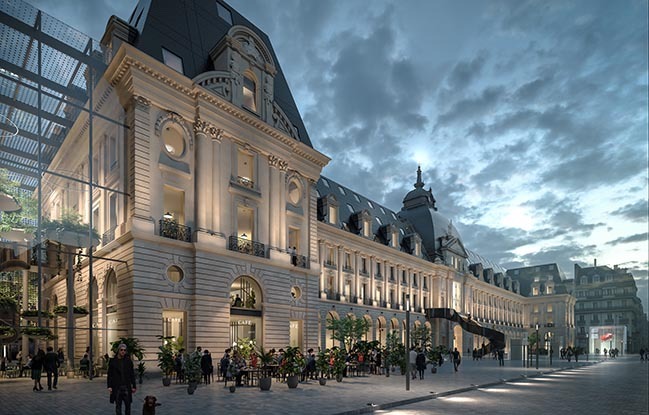 The basements of the building will not only be used more effectively, but will be extended underneath the Place de la République to create more floor area. The roof will also be occupied, with a bistro included in the building’s central dome that takes advantage of the existing atmosphere of the dramatic structure. The spaces between the different roofs will be opened up to create a continuous passage from one end of the building to the other, with the gaps between the roofs and the dome covered with glass, so that the original skyline of the building is maintained. MVRDV designed the Palais du Commerce alongside co-architects Bernard Desmoulin. The principal developer for the project is Frey, with Engie Avenue as co-developer. Construction will begin in 2022, with completion expected for 2025.